The Little Match Seller (Silent Night) by The Puppini Sisters is today's song of the day. Yes, it's a Christmas song. And I cannot believe I have forgotten to share this song the last few years around the Christmas holiday. But that means I can easily share it here today. I fell in love with The Puppini Sisters when they reached the height of their popularity about five years ago. I'll admit this isn't one of my favorites despite the lyrics adapting so well to the melody of Silent Night. But it is rather dreary and I love the pep of the group. Their tight harmonies are amazing and the humor is fun. If it were possible I would have worn out my MP3s from Betcha Bottom Dollar in 2007. I feel so reminiscent now... Of course, you have to have a big retro bone in your body like I do. But it's fun to hear what they do with Wuthering Heights and Heart of Glass, too. Here is a video of the song using an animated short of the story, not an official Puppini Sisters video but you can hear the entire song this way. Go to this page and enter the code HITUMBLR to get a $2 credit which will buy you 2 of the songs I've featured this month for music month (well, most of them). Or $2 off a full album. The code expires April 2 and is a nice way to end music month on the blog. What two songs would or will be your picks? 1. Prior to making a purchase, click the button below, enter the code HITUMBLR, and click the "Apply" button. Your $2 credit will be automatically applied to your account. View your current gift card and digital promotional balance or enter a new claim code below. 2. If you received a confirmation that your code has been entered successfully, your $2 credit is now in your account and will remain there until it has been applied towards eligible purchases or until it expires at 11:59 p.m PST on April 1, 2012. If you receive an error entering your code, be sure to check that you've entered the code correctly and be sure that the promotion is still valid and has not expired. If you still receive an error, contact Customer Service via Amazon MP3 Support. 3. Browse for your favorite music at Amazon MP3, find the song, playlist or album you want, click the "Buy" button, and the dollar amount of your code will be automatically applied to your purchase. 4. If you have not used the full $2 value of the promotional code on your purchase, we will automatically apply the remaining balance of your code on each of your additional Amazon MP3 purchases until you have used its full value or until the code expires, whichever occurs first. You can check your code balance by clicking "Redeem Your Amazon.com Gift Card or Promotional Code and View Balance" button, visible on every MP3 detail page. 6. 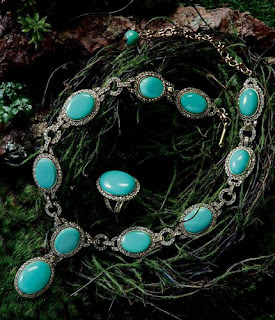 Promotional offer is valid from March 29, 2012 through April 1, 2012 and subject to change. You must redeem the credit by 11:59 p.m. PST on April 1, 2012. Limit one promotional credit per customer. 7. Additional Terms and Conditions apply. Stay Awake: Various Interpretations of Music from Vintage Disney Films has some interesting interpretations of some Disney classic songs. Some are virtually unrecognizable. Most are not from fairy tale films. After all, the CD was produced in 1988 before Beauty and the Beast and some of the more recent films had become classics. Snow White, however, has two songs with unusual treatments. And since the new Snow White film is released today, I thought sharing these Snow White songs was rather appropriate and even a little ironic (if you listen to them). 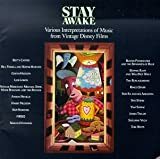 For your music month, I would like to recommend STAY AWAKE: VARIOUS INTERPRETATIONS OF MUSIC FROM DISNEY FILMS. This is NOT a Disney release, but re-interpretations of Disney fairy tale songs from everybody from Tom Waits to Sinead O'Connor, Suzanne Vega and Bonnie Raitt (and many more). The best is Tom Waits doing his renditon of "Heigh Ho, The Dwarf's Marching Song" (he turns the dwarf's mining into forced labor - you can hear the chains dragging in the background and the despair in the "Heigh Ho" chant.) "Someday My Prince Will Come" by Sinead O'Connor is another good one. You might better call this "Alternative Disney." Rumor has it that Disney was upset by this interpretation and managed to keep the CD from being reprinted or rereleased, hoping it would disappear after the first printing went out of print. But the internet keeps it alive now thanks to YouTube and others. Be quick, be quick, for today only the ebook version of Cloaked In Red by Vivian Vande Velde is temporarily priced at 99 cents in ebook format as part of the daily deal at Amazon. There are several YA books in the deal today, but only one was fairy tale related. I was actually shocked to see it listed since it wasn't released in ebook format until last month, over a year after its release. I had finally given up on it ever being released in ebook a month before that and ordered the paper edition although I haven't read it yet. I am often quicker to get a book read on my reader, I admit. Needless to say, I am thrilled to have an ebook edition for a great price, especially right now when I am packing my books for my move. So you think you know the story of Little Red Riding Hood, the girl with the unfortunate name and the inability to tell the difference between her grandmother and a member of a different species? Well, then, try your hand at answering these questions: Which character (not including Little Red herself) is the most fashion challenged? Who (not including the wolf) is the scariest? Who (not including Granny) is the most easily scared? Who is the strangest (notice we're not "not including" anyone, because they're all a little off.)? Who (no fair saying "the author") has stuffing for brains? Master storyteller Vivian Vande Velde crafts eight new stories involving one of the world's most beloved (and mixed-up) characters in literature. 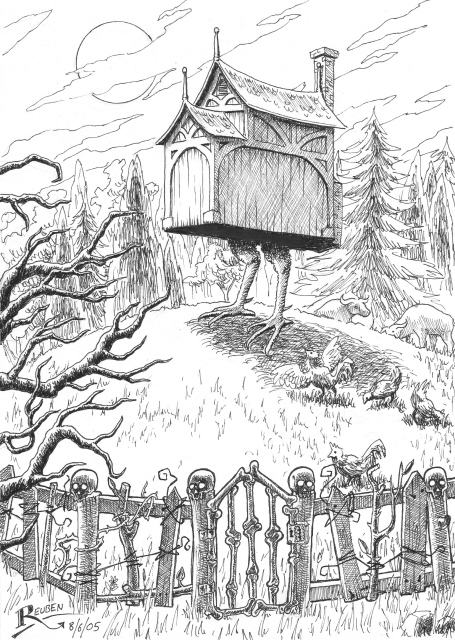 You may never look at fairy tales in quite the same way again. Cinderella by The Cheetah Girls. Yes, I had to do it. I prefer this song to the Britney Spears one I also featured today. Poor Cinderella. We really give her a bad rap in music. And she'd read me a story. The fairy tale life wasn’t for me. Who am I to deny you your Britney Spears fix of the day? Yes, Britney's Cinderella is our song of the day today. I debated between this and The Cheetah Girls. Should I do both? The Irresistible Fairy Tale: The Cultural and Social History of a Genre by Jack Zipes has an April 8 release date but the paper editions are already shipping. The book is also being released as an ebook so you have that option, too. If there is one genre that has captured the imagination of people in all walks of life throughout the world, it is the fairy tale. Yet we still have great difficulty understanding how it originated, evolved, and spread--or why so many people cannot resist its appeal, no matter how it changes or what form it takes. In this book, renowned fairy-tale expert Jack Zipes presents a provocative new theory about why fairy tales were created and retold--and why they became such an indelible and infinitely adaptable part of cultures around the world. Drawing on cognitive science, evolutionary theory, anthropology, psychology, literary theory, and other fields, Zipes presents a nuanced argument about how fairy tales originated in ancient oral cultures, how they evolved through the rise of literary culture and print, and how, in our own time, they continue to change through their adaptation in an ever-growing variety of media. In making his case, Zipes considers a wide range of fascinating examples, including fairy tales told, collected, and written by women in the nineteenth century; Catherine Breillat's film adaptation of Perrault's "Bluebeard"; and contemporary fairy-tale drawings, paintings, sculptures, and photographs that critique canonical print versions. While we may never be able to fully explain fairy tales, The Irresistible Fairy Tale provides a powerful theory of how and why they evolved--and why we still use them to make meaning of our lives. Jack Zipes is professor emeritus of German and comparative literature at the University of Minnesota and the author, translator, and editor of dozens of studies and collections of folk and fairy tales. His recent books include Why Fairy Tales Stick: The Evolution and Relevance of a Genre; Relentless Progress: The Reconfiguration of Children's Literature, Fairy Tales, and Storytelling; and The Enchanted Screen: The Unknown History of Fairy-Tale Films. You can also read the first chapter here. Or click to look inside the book on Amazon where you can preview the book, too. 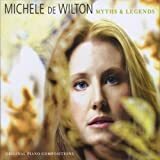 Myths & Legends by Michele de Wilton is a collection of original piano music inspired by, well, myths and legends (yes, I know the title gave that away) as well as a fairy tale. Her Waltz for Gerda & Kay is obviously inspired by The Snow Queen. 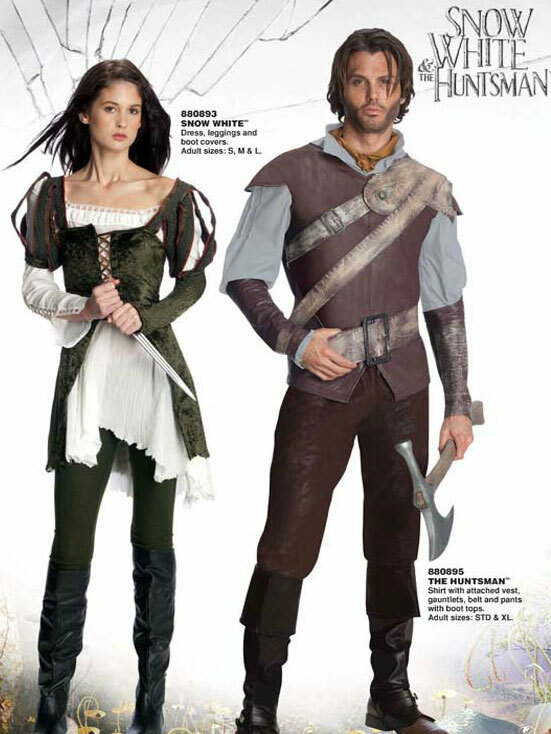 We also get Cupid & Psyche for Beauty and the Beast fans. The playlist also reveals The Lady of Shalott and The Ice Maiden (not the Snow Queen). Another CD has a song inspired by The Selfish Giant. So if you enjoy piano music, this may be in your taste. The Fairy Godmother Dilemma: Catspell and The Fairy Godmother Dilemma: Firespell and The Fairy Godmother Dilemma: Applespell by Danyelle Leafty comprise a trilogy of books about fairy godmothers. And fairy godmothers are always popular around here, so I had to share. Through the end of March, the royalties for Catspell are also going to Kindles for Kids. The fairy godmother dilemma continues in book two: Firespell. Book Three in The Fairy Godmother Dilemma Series. So folks, you may be wondering why I have been mostly absent as well as my sudden reappearance. Unfortunately, I am only in the eye of the storm and am playing catch up--or at least trying to get my head above water--for the last few days. Tomorrow the chaos starts afresh for me. What happened is that my John Dear and I have bought a new home--or should be closing on one later this week. Although the plan was to relocate sometime during 2012 this came upon us much sooner than expected. As in, virtually no pre-planning was involved. John was casually looking at houses and I casually agreed to walk through a few, mostly to show appreciation for his efforts in real estate research. And what do you know? The FIRST HOUSE was THE HOUSE. The house I needed to fall in love with enough to inspire me to uproot myself from my beloved home of the past eight years. For I adore my current home despite some of its faults and inconvenient location. It is filled with light even on the gloomiest days which is a necessity and keeps me working, not curled up in a corner mourning the sun. You see, I work from home. I am a homebody. Eight years ago we searched and searched for a house that would fit our needs and it took months and months. We ended up finding a floorplan that worked and gutting the house. We couldn't even move in for three months after closing. This house has been customized to my needs and tastes and I have loved it ever since we moved in. That was then. Now our work patterns and needs have changed as well as family needs. We love our house but its inconveniences outweight its benefits. This year we found the house that better suits our current needs--and it needs work, too, but mostly extensive painting and a few fixture changes, not full gutting. There was no waiting on it since a bidding war was threatening because the price had dropped significantly the week we saw it. So I woke up one morning with affection for John and his enthusiasm but with no plans to move anytime soon, months at least as I prepped and planned for the dreaded uprooting. Silly me, I went to bed that night with a contract on a new house. With NO preplanning. All of the sudden I was covered in home buying/selling paperwork, my regular job (the one that pays the bills, like house notes) as well as prepping our current home for selling. That meant packing and decluttering and painting primarily. The highs and lows in home buying/selling don't need to be recounted here but the end result is that a month later we are closing on the new house and need to start the work to make it move-in ready. Meanwhile I keep working the paying job and trying to occasionally sleep, too. So SurLaLune, while it is my passion, is not getting my full attention. And it won't be for another six to eight weeks as we transition and complete the moving process. While working the jobs that pay the bills. 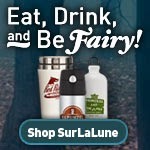 SurLaLune supports itself, not me, alas. When you are self-employed, you cannot take time off from work for moving. One works and moves and is grateful for the opportunity to earn the money that makes it all possible even if sleep is elusive. And I really wish, at times like these, that my house was on chicken legs and could move and grow and accommodate my needs at my whims. Magical closets and windows that catch all the day's light and that I never, ever had to pack box after box after box. With the knowledge I will have to unpack it all again soon. Ugh. (Why do I own so many books?) 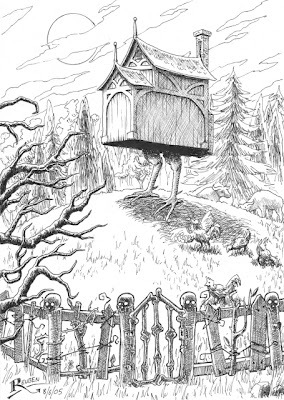 But Baba Yaga I am not, so I must do things the hard way. So I am blessed and all is well, just really, really intensely busy at the moment. I have family and friends who love and support us. Life will be more enjoyable in a few months. Right now it is merely adventurous and stressful. But I have ideas on how to invite you to participate here and keep SurLaLune rich with content. So stay tuned. Some of you, especially Gypsy, have already been beyond generous and I adore you all for it. And when this has passed I will also be starting new SurLaLune projects and finishing some other ones. Stay tuned. Big things are happening, projects I started before I decided to uproot my life! They are on hold, but the wait is only making me more anxious to start them. So HSN (Home Shopping Network) is going to devote 24 hours to selling Snow White inspired merchandise and offering behind the scenes information about the SW&H film on May 30th, shortly before the film's release. And the kicker is that I am tempted. Darn it. I find myself attracted to some of these pieces despite my wishes otherwise. I want to see the mirror they describe and some of the other materials, too. I doubt I will indulge but I will be tempted to look and HSN does a great job at sales pitching. There's even nail polish, but fortunately that fetish of mine is not tempted by reds and pinks. I own some Deborah Lippman brand and don't need those colors even if they have cool names. 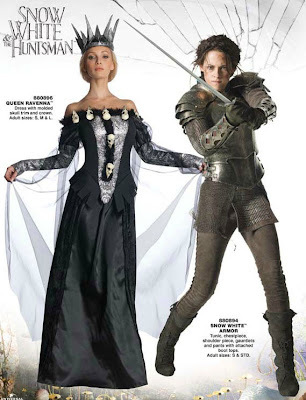 “It’s really powerful to link the storytelling and products,” said Stephanie Sperber, president of partnerships and licensing for Universal Pictures, which produced the Brothers Grimm-inspired tale starring Kristen Stewart and Charlize Theron as the dueling beauties. The May 30 HSN event, just before “Snow White” opens nationally on June 1, is trying to drum up viewer interest. 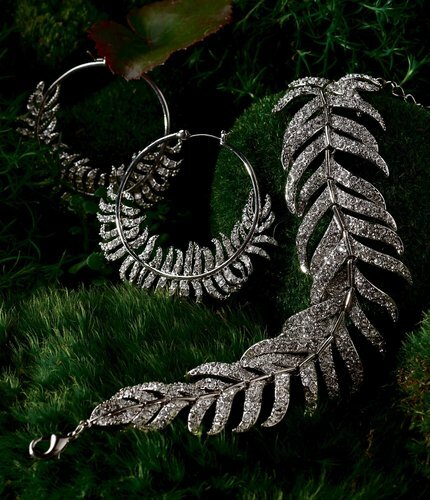 Exclusive behind-the-scenes looks at the film version, with its fantastical effects, striking scenery and scary twists, will be combined with products specifically created to evoke the film’s themes of beauty and power. There is no product placement, but Ms. Theron wears Evil Queen jewelry that inspired HSN’s apple-shaped brooch and about 200 other products, including several mirrors, that will be offered to home shoppers with footage from the movie’s filming in and around London last year. In advance of its “Snow White” programming blitz, HSN plans to show the movie to its employees — as with “Eat Pray Love” — to help its call-center workers respond more readily to shopper questions about products and their connections to the film. HSN also was on the set in England to film interviews and footage for the behind-the-scenes material that will be part of its May “Snow White” session. HSN also is showing a movie trailer on its site, and mailing 1.5 million program guides to its households to build awareness among viewers. It will also promote the event on other television networks, but it has not yet settled on which ones. 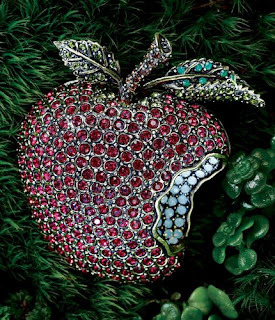 In addition to the apple-shaped brooch designed by Heidi Daus, other products include a twig-and-butterfly bordered mirror designed by Hutton Wilkinson, candles by D.L. and Company, and Richard Mishaan-designed candlesticks, lamps, mirrors and decorative pillows. 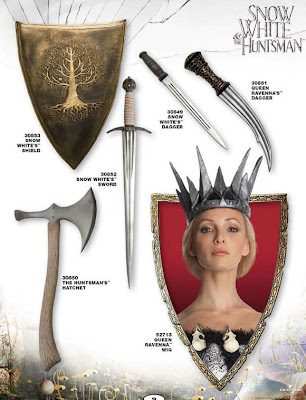 Each designer is scheduled to talk about the wares related to “Snow White” during the HSN event. Shoppers who use mobile devices, including tablets, will be able to watch clips on products and the film, and talk about them on social media like Facebook and Twitter. Just in time for Halloween! Wait, it's March! Well, these aren't released yet, but they are started to be listed so you can start planning accordingly. Snow White and the Huntsman Halloween costumes. Amazon already has some up for preorder actually, but no images yet although I found some for you. Enjoy! 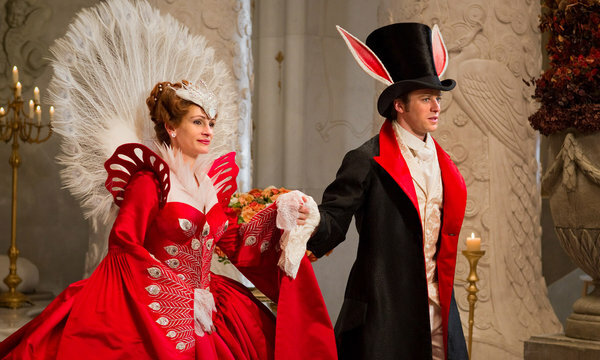 “Mirror Mirror” works hard to let the audience know that it’s aware of its own silliness. Although the story is set in a vaguely medieval fairy-tale kingdom — easier to conjure now, with digital effects — the tone is cheerfully, unapologetically anachronistic. The mean queen seems to have stepped out of one of the riper episodes of “Desperate Housewives,” while practically every line in the picture is delivered like a sitcom zinger. (Was there really so much insult humor in the Middle Ages?) And the story has been altered to reflect more contemporary notions about the roles of men and women. Snow White is a much more can-do kind of princess than the passive heroine of yore, and this Prince Charming is quite a bit less masterful. He can’t stop Snow from saving him, when he believes that he should be saving her. “It’s been focus-grouped,” he protests, to no avail. Despite — or perhaps because of — its rigorous lack of seriousness, “Mirror Mirror” may please its focus-grouped audience of children and tweens. (At the youth-intensive screening I attended, the seven dwarfs, a bickering band of brigands, stole the show.) It doesn’t tell us much about how we should think of fairy tales in our unenchanted present day, though. The rest of the article briefly discusses NBC's Grimm and ABC's Once Upon a Time as well as some of the upcoming films. I'm expecting many more articles in the coming weeks, especially about upcoming films, since studios will want to ride the publicity bandwagon surrounding Mirror, Mirror. So who is planning to see the film this weekend? Mirror Mirror: The Movie Novel and Mirror Mirror: The Movie Storybook are already available so you can read and "spoil" the movie for yourself. Somehow--and this is not cynicism--I am not expecting many surprises in this movie so I doubt there is much to be spoiled. I feel like the previews have covered the material excepting perhaps a few jokes. These are aimed at children--the publisher is Scholastic after all. So these might work especially well with difficult readers as so many movie tie-in books do. If children are reading, I am pleased. I hope many of them fall in love with this movie since it bodes well for the fairy tale's future! 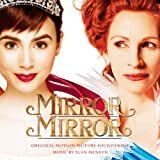 The Mirror Mirror (Original Motion Picture Soundtrack) will be released on April 10th with mostly instrumental music composed by Alan Menken, yes, the Menken of a majority of the most successful Disney projects of the last 20 years or so. The CD is supplemented with two remixes of "I Believe in Love" performed by Snow White herself, Lily Collins. I have a video of the Mirror, Mirror remix below from a fan. It also provides somewhat of a preview of the movie. It is really hard to believe these two movies--this one and the upcoming Snow White and the Huntsman--are inspired by the same fairy tale, isn't it? So is the power of fairy tales! The accompanying music video directed by Marc Webb and filmed in Hollywood, Los Angeles was based on the fairy tale Little Red Riding Hood. It portrays Lee and her ex-lover, played by the British actor Oliver Goodwill. 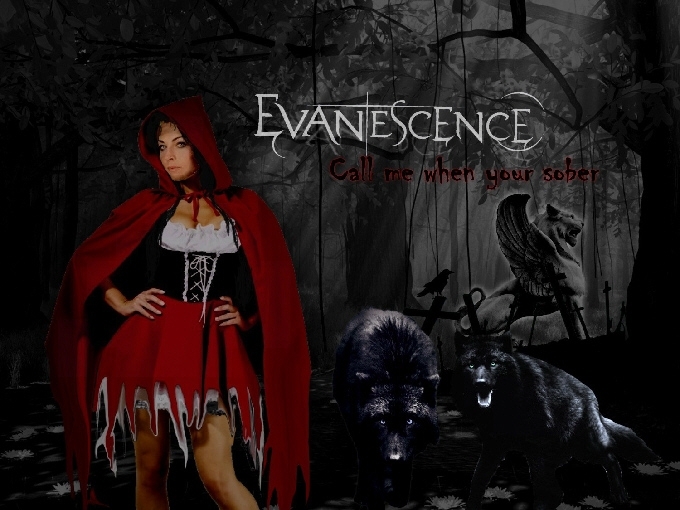 Segments of the band performing the song and Lee singing with wolves are also shown during the video. 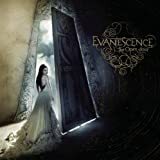 The song has been marked by some as an indication of the band turning away from their personal self-destructive behavior at the time, though it's clearly centered around the break-up of the lead singer and her ex. I can't find any confirmation of this supposed 'turning point' beyond rumors and apart from it being a very big hit, particularly because of the Red Riding Hood imagery, I'm not sure it made a lasting impact on the band, though it makes for a nice way to editorialize the band's journey. :) The lyrics are very straight with no metaphors or allusions to Red Riding Hood at all but being so straight was apparently one of the reasons they wanted to play with imagery in the music video - to give it more resonance. It appears to have done the job very well (and made the band another hit). "These live wolves came in, and they each had trainers and it was really fun.[...] I thought it was really cool, but then when they came in, they were 150 pounds. So I was like, 'Wow, if I got on all fours, I'd be about the same size as this huge animal.' But it was me and the wolves in the room, and it was all cool. It was awesome. My allergies kicked in, but I powered through. And then we shot the scene at the vanity with the Big Bad Wolf coming over my shoulders and trying to seduce me." The video begins with Lee wearing a red satin cape, and singing while sitting on opposite ends of a dining table with her "lover", played by British actor Oliver Goodwill. Lee is then shown standing in front of a mirror while her "lover" comes behind her; he starts to massage her shoulders and prepares to kiss her, but Lee refuses, saying that he is "too late". This cuts to Lee and four back-up dancers descending a staircase, where upon reaching the bottom, first Lee then the dancers are lifted into the air. At the end of the song, Lee walks atop the length of the dining table, while chairs and tabletop items are flung aside as she passes. She reaches her "lover" at the end, places her finger on his lips, and sings "I've made up your mind". Shots of the band performing and of Lee sitting with wolves are interspersed amongst the other elements of the video. 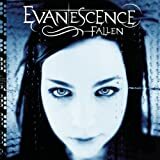 Since we're on the subject of Evanescence, mention should be made of their arguably biggest hit, "Bring Me To Life". Although the music video is fairly straight forward with regard to sleeping and waking (and "not dying") metaphors, the music and lyrics have been heavily connected with fairy tales, particularly Sleeping Beauty and Snow White, though I've seen it connected to The Little Mermaid as well. It was also popular in Christian circles for a while, being seen as a cry for spiritual awakening, until Evanesence's record label finally stated that despite the "...spiritual underpinning that ignited interest and excitement in the Christian religious community," Evanescence are "...a secular band, and as such view their music as entertainment(source) The song was pulled from many Christian playlists directly after this statement but the metaphor was (and is) such a strong one it's stuck with the public at large, resulting in many fan-made remix videos at the time, showing fantasy imagery and allusions to a gritty yet fairy tale-like awakening. You can see a recent fan-made image-mix video HERE which uses "Bring Me To Life" as Snow White's theme and centers mainly on the soon-to-be-released movie Snow White and the Huntsman. I sort of wish they'd continued in their creativity and included more variety as they did at the start of the clip but I agree - it does fit well as a theme for her. 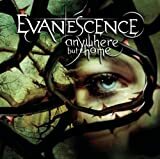 By the way, this is the image of the official live CD/DVD released which includes two performance of "Bring Me To Life" (one is an "easter egg"). Nicely reminiscent of Sleeping Beauty, don't you think?